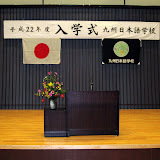 We hold an Entrance ceremony on 11th Oct. for new students. They are from Vietnam,China,Nepal,U.S.A.,Switzerland and Tanzania.Welcome to KLS! !